Three-day courses are available in my fully-equipped workshop. With a maximum of five students per course, each student will receive the utmost in personal attention and are tailored to the requirements of the student – whether just beginning or advancing skills. Each course will emphasize tool technique, sharpening, design, shape, form and aesthetics. The classes are “Hands-on” and are tailored to the need of the individual. (The best way to learn is to “do it”, not talk about it). This is possible due to the small number of students (Limited to 5). Each student will be working on a their own lathe. Projects are whatever you want to do with wood being the limiting factor. 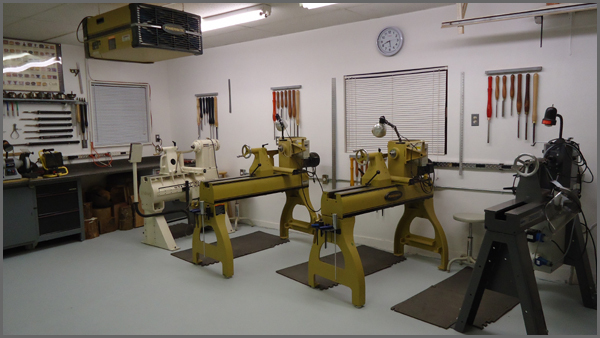 Each lathe station has two chucks, lathe accessories and a full set of tools. Specialty tools are also available for use such as hollowing tools. Finishes, abrasives, etc. are provided. Bench grinder, belt and disc sander for sharpening. Everything you need is included in the price of the course so unless you have some special tools you want me to sharpen, you don’t need anything. Note: Private tuition for one or two students available upon request and subject to availability. Gift vouchers also available upon request. All reasonable efforts are made to ensure that the price and courses described on this website are up-to-date, correct and as comprehensive as possible. However these may change due to circumstances beyond my control. Before booking a course, please contact me so that we may discuss any particular requirement you might have.